Choral Evensong is the old ‘Fully Choral Service’. Through most of church history in England, something like it has existed. Minimally, it requires there to be a choir, and that the choir sings music of sufficient complexity that it requires some training and rehearsal. You would expect the choir to sing through-composed music for the responses (what were called ‘festal responses’ by their Renaissance composers) and canticles, with psalm(s) in Anglican chant and a choral anthem. The grey area is where a choir, perhaps for Lent, tones down the musical offering with plainsong or Anglican chant replacing through-composed items. It is frequently slandered that Choral Evensong is a self-indulgent concert dressed up as Christian worship. It would be wrong not to admit that can be true. Yet many do find deep meditation and worship at Choral Evensong, whether we are clergy, choir or congregants. Passivity does not indicate lack of worship. Some, finding limited opportunities for organised congregational participation, imagine these are not so much services as liturgical concerts. But each service is an act of worship addressed, as worship must be, not to you but to God, the Father of Christ and our Father; an act of thanksgiving for the love He has shown towards man, an act of intercession for all men. As Henry VI intended when he established the Chapel and the Choir, this worship goes on daily, whether people come or not, because the love of God is a continuing, living and unconditional reality. We are, however, psychologically, politically and theologically aware of the role and presence of the worshipping laity, in a way that cannot simply be shunted to sidings by well-meaning God-centrism. I see it as an exchange: the congregation comes to worship, and places its thank-offering into the hands of clergy and choir that they may offer a more pleasing fragrance. Or, more bluntly, if the congregation are rendered passive while a choir sings poorly, or ‘performs’ in such a way as to exclude the congregation, the exchange is a bad one. This may sound like a tautology — a sung song — but see the next bit for why it is not. It is too simplistic to say that Sung Evensong is a Choral Evensong with easier music, but that is the rough territory. Actually, I have experienced good Sung Evensongs that move me as much as the finest Choral Evensong. They were good because congregational participation, sometimes with a choir to lead, was the key element. There is quite some scope for recovering ways to sing Evensong without having to wrestle with fully-choral musical tradition. At its best, it requires a congregation that wants to sing and is willing to learn some simple chants, alongside church musicians who are happy to share the music more democratically. The responses, psalm(s) and canticles can all be sung to simple chants, entirely or mostly monodic (just a melody line), perhaps with a few stronger singers (who need not be ‘up front’) filling out a harmony or three. The so-called ‘Ferial Responses’ fit this bill admirably, and can be varied by being in unison or harmony, accompanied or not. Plainsong, Anglican chant (perhaps just using simpler, seven-bar single chants instead of the usual double chants) or more modern chant species (Gelineau etc.) can be used by a congregation to sing the psalm(s) and canticles. After some practice, this arrangement can be quite edifying for a congregation. An anthem is not required, but that might be a choral piece, for a choir that still wants to prepare and offer a little something. Or it might be an instrumental piece — a small-church organist might be delighted to be offered the chance to perform a musical meditation on the organ without people moving or talking over it. Or we could sing a hymn: it is OK to do that! I do not think that it is the best solution, but one imaginative approach is to look for hymns that are metrical versions of the psalm(s) and canticles, and sing them instead of the unmetrical texts. Timothy Dudley-Smith’s ‘Tell out, my soul’ and ‘Faithful vigil ended’ can do duty for Magnificat and Nunc dimittis respectively, and his ‘We believe in God the Father’ can replace the Apostles’ Creed. Rory Cooney’s Canticle of the Turning, to the tune Star of the County Down, is a wonderful, fresh, metrical paraphrase of Magnificat. As for the alternative canticles, Cantate Domino (Psalm 98) has been set as ‘New songs of celebration render’ by Erik Routley, or Michael Baughen’s ‘Sing to God new songs of worship’ to Beethoven’s Ode to Joy, and Deus misereatur (Psalm 67) has been set as ‘God of mercy, God of grace’ by Henry Francis Lyte. Seeing as ‘Evensong’ is the name, or nickname, of the evening office, it is not entirely daft to speak of a ‘Said Evensong’. To counter this potential for appearing daft (an enterprise not entirely thoroughgoing in the church), many simply label this as ‘Evening Prayer’, leaving all who pass by to work out for themselves that it is a said, and perhaps minimalist, office. Said Evensong might be the poor relation here, but let us be bidden to remembrance that the offices are daily prayer, not just for Sunday best, and the cleric’s cold be-hassocking mid-week (and that of a few faithful) is of valiant mention. Solemn Evensong is of a slightly different category. Basically, it is Evensong with Catholic ritual added. Characteristically, it requires the use of incense, used to cense the altar during Magnificat. Whereas clergy usually officiate at Evensong from stalls in the choir (the ‘accustomed Place’ of peculiar rubrical direction), they are more likely to sit in the sanctuary for Solemn Evensong. Servers processing with candles and cross are also to be expected at Solemn Evensong. 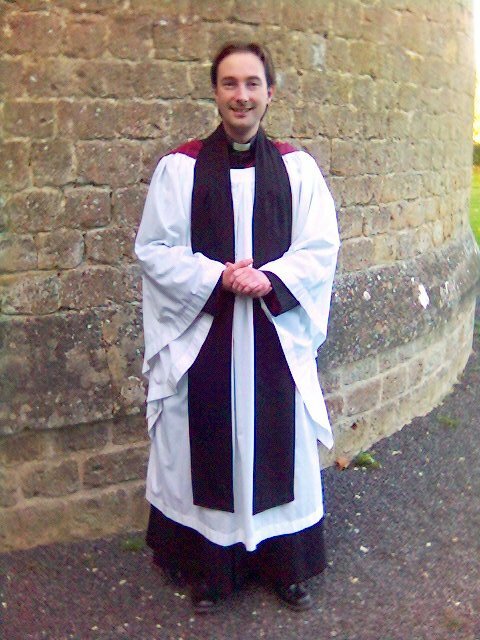 The clergy are also more likely to wear stoles and copes at Solemn Evensong. A Solemn Evensong is almost always a Choral Evensong, with those ritual elements added, but that need not be the case. As it is an Anglican Catholic take on Evensong, following the anthem with a service of Benediction (showing a reserved eucharistic host, meditation and prayer, and being blessed with it) is a popular combination. Festal Evensong is another slightly overlapping category. A Festal Evensong is most likely to be a Choral Evensong, and, if the church is known to be quite High, a Solemn Evensong. The title means different things in different churches. It could be an Evensong done on a feast day, or just what the church magazine says when a ‘Big’ Evensong is offered. So, guess, ask at the pub across the road, or adventurously go and find out. Michael Perham gave some interesting directions for how a cathedral or church that regularly offers Choral Evensong can ‘pimp’ it up on special occasions to become a Festal Evensong (‘The Festal Office’. The Cathedrals’ Liturgy and Music Group Occasional Papers 12. 2003). However, most advertised Festal Evensongs are not this big and experimental. Many thanks for this – much appreciated. Evensong as a chorister, was always my favourite service; a packed church where everyone sang their hearts out, responses Mag and Nunc, Pslms, then a good Choir only Anthem, well prepared. [I remember one Friday evening, not escaping till after 10pm as we couldn’t get it right !!] Happy and meaning filled times. When I worshiped for a time with a Poor Clair community, and again with a Cistercian Community, I found the office of Compline, a very special end of the day time. May I reprint this in our Parish newsletter? Dear Douglas, feel free to reuse this. You may want to abridge it for the newsletter though. I’m a self-confessed Evensong junkie in all its manifestations having sung and officiated at more than I can count. Many thanks for a superb article. Dear Kirby Smith, I thank you for your kind words of encouragement. I find the rhythm of Evensong most captivating. The layers of movement from sung scripture to spoken scripture are where its beauty lies. That might be worth a little exploration. I am so delighted that I have discovered your blog site. Its wonderfully written thoughts intrigue, inform and make me very glad that the world is full of many wise souls who, while searching out the trail of God in their lives, leave a trail of crumbs for others. I am very grateful. Thank you. Dear Rebecca, thank you for your kind words of encouragement. I’m glad that you enjoyed this article. You forgot one category: Festive Evensong (sic) as offered by a church in Detroit. The setting was VW in G (the ‘Village’ Service). Neither festal or festive. Well, I suppose ‘festive’ is a more common adjective than ‘festal’, although it does have something of the flavour of Christmas to it. The Vaughan Williams ‘Village Choir Canticles’ are good for what they are, but it does make me wonder what their ‘non-festive’ evensong is like. Most informative and so well written – and I love that someone finally admitted that one can be a little geeky about the liturgy. Thank you for your encouragement. I live in a geeky town, which makes geekery easy to come by. Good article. While I’m not an Anglican myself, I frequently worship in an Anglican church and regularly attend Evensong (of the “Solemn” variety). A few things I’ve noticed about the relationship between the Eucharist and Evensong. There are parishes that, while they rarely use the 1662 BCP for the Eucharist, will rarely use anything but 1662 for Evensong. As well, while the distinctions between “high church” and “low church” practice are very apparent in many places during the Eucharistic service, the distinctions are much more subtle during Evensong. Thank you, Bob. I think something of this liturgical relationship is due to the greater interest given to the eucharist. The 20th century saw much restructuring of the mass, so that many catholic and protestant churches have quite similar structures to their eucharistic liturgies. The work on the offices received much less attention, but there was a move towards streamlining the structure, introducing more biblical canticles, and focusing on a single gospel canticle or each hour. This means that the modern Church of England evening prayer (in Common Worship) has a Magnificat, but no Nunc dimittis. Seeing as the offices are much more about the regular recitation of texts, as opposed to the liturgical action of the eucharist, the changing or modernising of the texts has greater impact. For instance, I can easily do a modern-rite eucharist with a Renaissance musical setting, but it is impossible to do that for evening prayer. Some music has been composed for the modern offices, but most of it is rather simple chants for those who wish to sing the offices, rather than choral compositions for congregational edification. Not being a fundamentalist, I enjoy the variety of the Common Worship offices for saying by myself or with others, but the Prayer Book offices, with their rich musical heritage, still work best for the full-choral treatment. The high-low liturgical distinctions are there in the offices if you know what to look out for, but their reduced emphasis on liturgical action makes it more difficult to spot. Of course, a ‘solemn evensong’ is something that goes out of its way to introduce more ritual into the proceedings, and is definitively a high-church service. Thank you for your comment. I do love Choral Evensong, yet it is a difficult thing to do well. That’s why I think it’s useful to look at other ways of doing Evensong that can also be inspiring acts of worship. Even a good prayerful said service is preferable to an anxiously over-ambitious choral one. Thanks so much for all this, but can you shed further light for me, and others, on Office Hymns? Thanks for that question. It’s a good one. Before 1549 (when Cranmer promulgated the first BCP) most of the daily offices would have a Latin hymn associated with them. Because of our modern Protestant hymnbook culture, we tend to think of hymns as voluntary inserts into our liturgies, but the Latin corpus of office hymns were a proper part of the liturgy of hours. The only hymn that survived was the ‘Veni creator Spiritus’ (‘Come, Holy Ghost, our souls inspire’) in the ordination rites of the 1662 BCP, translated into English by John Cosins. The revival of Compline means that many of us are familiar with ‘Te lucis ante terminum’ (‘To thee before the close of day’). This is the standard office hymn of Compline. In most traditions, this hymn is sung without change at every Compline. In the Church of England, ‘Common Worship: Daily Prayer’ prints the text of hymn to be sung at Evening Prayer during each of the seasons (this Anglican practice began in 1968, and it is also the case in modern Roman Vespers). These three are ghosts of the office hymn tradition. When we have Evensong today, we often want to add some hymns to it. This isn’t a new predilection. It seems that Anglicans were singing metrical psalms before and after service from the very first Prayer Book. Like them, we could sing a hymn before ‘O Lord, open thou our lips’ and we could sing them all night after the Third Collect! Yet understanding the office hymn tradition meant that some took that as authority to insert a hymn into the flow of Evensong while some purists thought this anathema. In one draft of his proposed daily offices, Cranmer did have office hymns as still a part of our diurnal round. It seems a major force leading to their exile from the liturgy was that Cranmer could get the Latin repertory to sound good in English. The practicality is where is best to insert this foreign object into our tightly crafted Evensong. Evensong is a melding of pre-Reformation Vespers and Compline. At Vespers, the changeable office hymn comes before Magnificat. At Compline, the unchanging office hymn comes before the psalmody. So those positions have priority. Those who called for the Vespers pre-Magnificat position have mostly died out now, as this position is quite disruptive of the flow of psalmody, lessons and canticles. Here in college, we sing a hymn between the opening responses and the psalmody at Evensong on a Sunday. This hymn helps to set the tone of the service, and does not disrupt the flow. After all, Matins would make us Venite at the same point! I don’t believe every Evensong needs an office hymn, but I commend the practice. Like the rather restrained corpus of Latin office hymns, one should choose them with an eye to that tradition. Translations of the old office hymns (or sing them in Latin if you’re up to it!) are an obvious choice, and many have made their way into our hymnbooks. Metrical hymns of psalm texts would also seem fitting. Office hymns should not be anthemic, and should be rather simple in style and metre (Common and Long metres are the stallwarts). One might decide not to vary the office hymn too often, but leave one text as a marker of the season. For example, ‘Conditor alme siderum’ (‘Creator of the stars of night’) could be sung through Advent, ‘Vexilla regis’ (‘The royal banners forward go’) in Passiontide, and ‘Veni creator Spiritus’ (‘Come, Holy Ghost, our souls inspire’) at Pentecost. Outside of the seasons, an ‘evening hymn’ might work well, like one of the translations of ‘Phos hilaron’ (‘Hail, gladdening light’ or ‘O gladsome light, O grace’) or ‘Te lucis ante terminum’ (‘To thee before the close of day’ or ‘Thee, Lord, before the close of day’). Other popular and atmospheric evening hymns of our tradition are ‘ Abide with me’, ‘God that madest earth and heaven’, ‘Lord of all hopefulness’, ‘The day thou gavest, Lord, is ended’, ‘Glory to thee, my God, this night’. Thanks so much for this elucidation. When I have attended an evensong where an office hymn was sung, it always seemed an intrusion. The inclusion of an office hymn in the new Common Worship evening services makes much more sense.